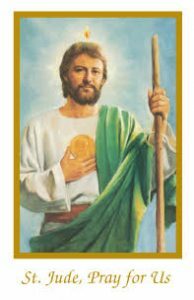 St. Jude is the Patron Saint of Hope and was one of the twelve Apostles. He preached the Gospel with great passion, often in the most difficult circumstances. Through the power of the Holy Spirit he made a lot of difference in people’s lives as he offered them the Word of God. St. Jude traditionally carries the image of Jesus in his hand. This recalls one of his miracles during his work spreading the Word of God. He is often shown an icon with flame around his head. This represents his presence at Pentecost, when he received the Holy Spirit with the other apostles. The St. Jude Prayer is a very special prayer indeed. So, when you're down and out, and nothing else seems to be working, the prayer to St. Jude is here for you. Come to mine assistance in this great need, that I may receive the consolation and succor of Heaven in all my necessities, tribulations, and sufferings, particularly [here make your request] and that I may praise God with thee and all the elect throughout eternity. I promise thee, O blessed Jude, to be ever mindful of this great favor, to always honor thee as my special and powerful patron, and to gratefully encourage devotion to thee. Amen.